Long before I recognized my mom for the excellent cook she is, it was my German-born grandmother who I held up as the master of all things kitchen-related. Her name was Freda Schloss (Nana Freda to me), and it was she who introduced me to things like herring in cream sauce, and poached eggs splashed with vinegar and tarragon—both of which she fed to me as a very little kid—and who always had a freshly baked chocolate cake (made from scratch, of course) waiting for me when I came to visit. No doubt it’s because of her own central-European palate that for as long as I can remember I’ve had a weakness for the kinds of flavors associated with this part of the world—dishes like sautéed cabbage in red wine vinegar, sauerbraten (a pot roast that’s cooked long and slow in a quantity of beer, wine, or vinegar), and wiener schnitzel paired with a dollop or two of lingonberry jam. In other words, rib-sticking dishes rounded out with some subtle heat or a touch of the acidic. 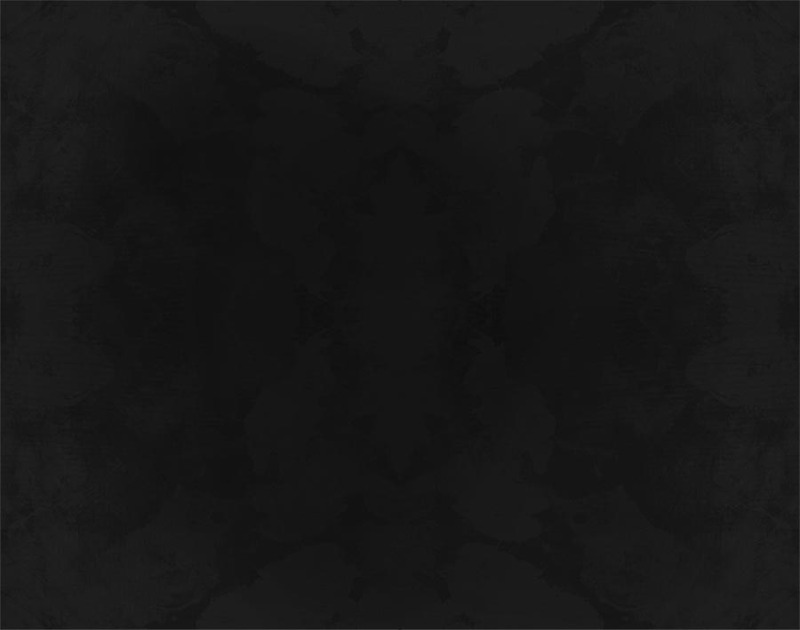 In fact, so engrained in me are these sorts of pairings that whenever I scan a recipe or a menu it’s dishes with this kind of yin-yang quality that I’m unconsciously searching for. 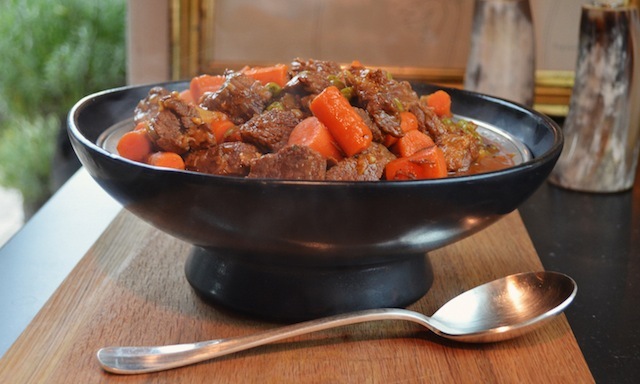 It’s little wonder then that while flipping through Ricky Lauren’s recently published collection of recipes (the full title of the book is Ricky Lauren the Hamptons) it was the one for her mother’s Hungarian beef goulash that immediately grabbed me. There’s a lot in the book to make your mouth water, from a chicken potpie topped with pureed sweet potatoes, to banana-blueberry whole-wheat pancakes, but it was her goulash recipe that I kept circling back to. Maybe it was the fact that she calls the dish “Nana’s Hungarian Beef Goulash,” (a title that couldn’t help but make me think of my own beloved Nana), or perhaps it was the homey simplicity of the recipe, but whatever the case it was a dish I couldn’t stop thinking about—and the drumbeat only got stronger as the thermometer began to fall. 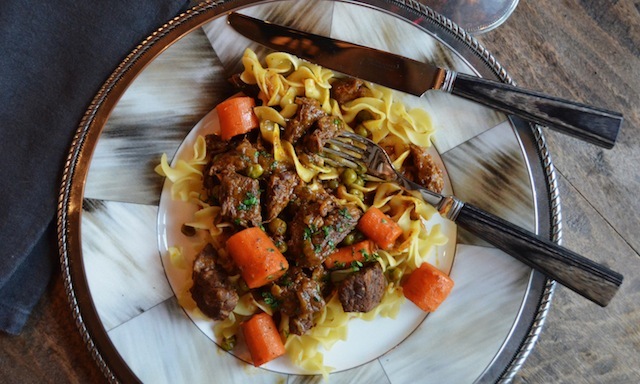 Like many of the items in the book, the goulash recipe comes with a brief anecdote—about how it was that Ricky Lauren’s Austrian mother came to master what can only be called one of Hungary’s signature dishes. That personal thread is one that wends its way through the entire collection, and is something that, along with the short historical snippets sprinkled throughout the book, imbues it with an almost memoir-like quality. It’s a fitting characteristic for a book in which so many of the recipes are clearly ones the Lauren family has been enjoying for years, if not generations. In the case of the dish I bring to you here, it’s a recipe that Ricky Lauren’s mother learned to cook while spending a summer with her uncle—not in Hungary as you might imagine, but in Czechoslovakia, a country with a certain amount of cultural give-and-take with its various neighbors, all of whom were at one time part of the same Austro-Hungarian Empire. That melting pot quality is one of the real pleasures of this dish. 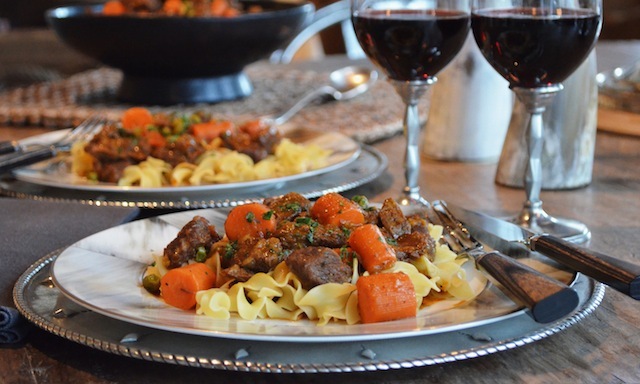 In fact, anyone who is unfamiliar with goulash is likely to be struck by how similar the recipe is to that for one of our own national dishes: good old beef stew. 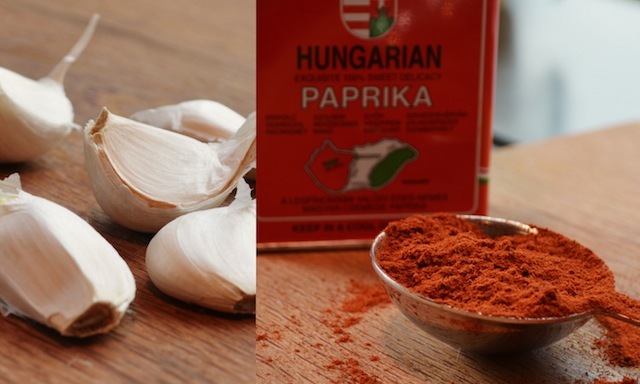 Similar, that is, until your eye scans the list of ingredients and you come across the word “paprika”—one of Hungarian goulash’s principal flavoring components, and the point at which it forks off from so many of those other dishes featuring beef that’s braised long and slow in a quantity of liquid. As such it’s a little bit like a gypsy caravan that’s wandered into the English countryside, introducing a whiff of the exotic into an otherwise staid and familiar landscape. 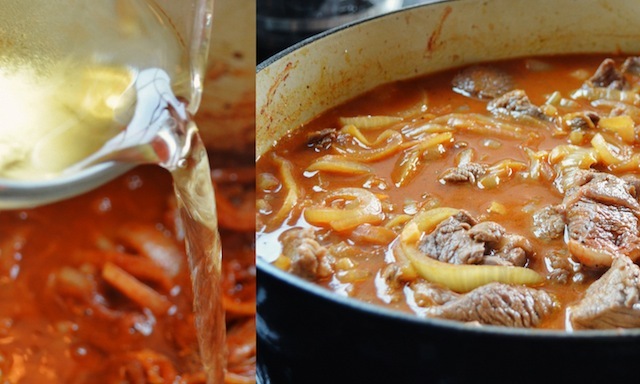 Which is not to say that Hungarian goulash is just for those who like their food spicy, or even boundary pushing. Quite the opposite, in fact, since the presence of the all-important paprika can be dialed up or down according to personal preferences. For instance, as written, Ricky Lauren’s recipe offers a gently flavored rendition of the dish that calls for just a half-tablespoon of paprika—certainly enough for this key ingredient to shine through, but not so much that it will put those off who might be in search of something on the milder side. If that isn’t you, then try swapping out the traditional paprika called for here with the more strongly flavored “sweet paprika” (also marketed under the name “Hungarian paprika;” “sweet” here is a bit of a misnomer as it’s actually spicier than the standard) and increase the quantity by as much as 3½ tablespoons (to a total of 4 tablespoons). The addition will imbue the dish with even more of its signature reddish hue, while ensuring that it also has more of pronounced paprika flavor—perfect for those of us whose idea of heaven is getting lost in a spice market. 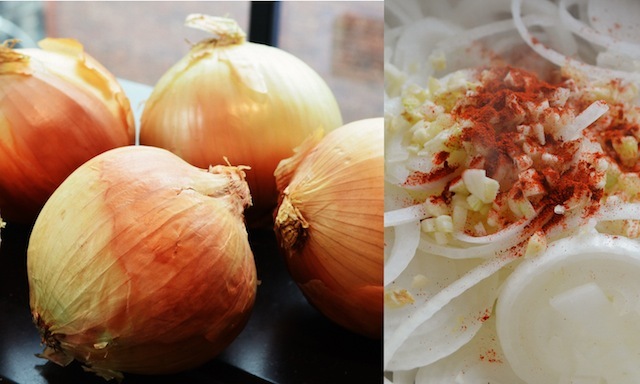 And two other tricks for those interested in dialing up the flavor quotient slightly. The first is to toss the cubed beef in a quantity of salt and pepper prior to searing—a process that helps ensure each forkful of meat has plenty of rich beef flavor. And the second is to swap out the 3½ cups of water (which, along with the beef broth, comprises the stew’s braising liquid), replacing it with the same amount of white wine. The latter is a move that injects the finished dish with a little of that acidity I like so much and that seems to me particularly well-suited for a dish as rich as this one. Still, like the paprika suggestion mentioned above, it’s a switch that may not be for everyone. The key is to play around to find the exact ingredients and proportions that suit your palate best. And even in its un-fussed over form, the recipe as written delivers no shortage of wonderful flavor. 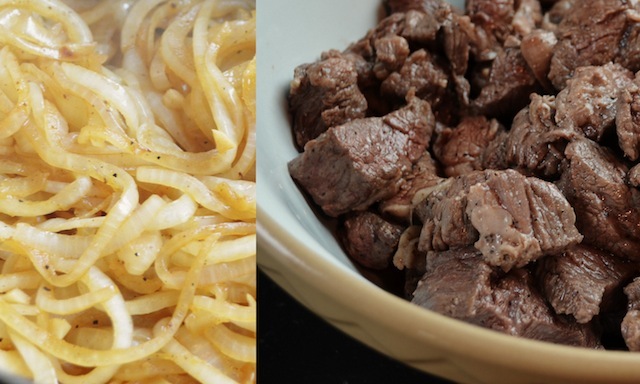 How could it not, considering the presence of all that onion and garlic, which has been given a good five minutes or so to soften up in the presence of some oil, before being joined by a sprinkling of paprika and the aforementioned browned beef? Or when you consider that to all of this is added the various braising liquids, the remainder of the paprika, and the bay leaf (it’s amazing what a single bay leaf can do! ), before literally being left to stew (in this case, “simmer”) in its own juices for several hours. 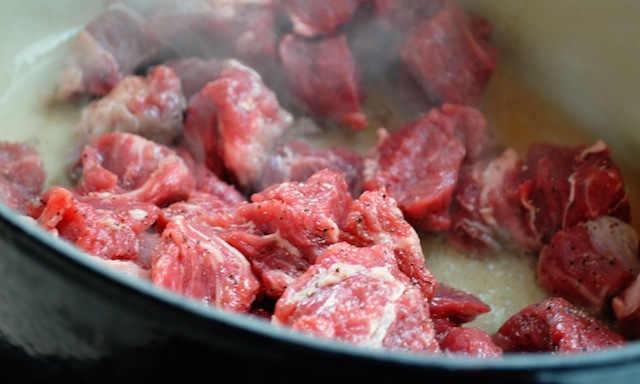 It’s a process during which the meat magically breaks down, transforming into something almost buttery, and when the various flavors held within the pot merge to create a rich, unified whole. No single ingredient better demonstrates this bit of kitchen alchemy more effectively than the carrots, which are added to the pot (along with the 2 cups of peas) just at the point when the meat becomes fork tender, which is to say at about 2 hours. 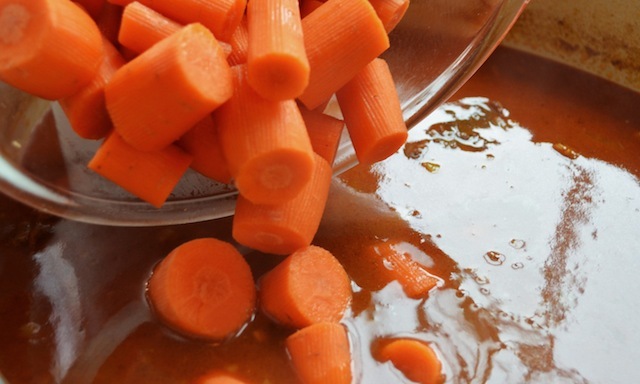 Sample this addition forty minutes later when the carrots themselves are tender, and you’ll discover something that’s unmistakably carrot, but one that’s nonetheless both candy sweet and full of rich beefy flavor. It’s hard to imagine anything more delicious or soul satisfying—an addition that’s as bright on the palate as it is on the plate, and a taste, quite literally, of things to come. All that remains is to adjust the seasoning (it will likely need some salt and pepper), thicken the sauce with a paste made from 3 tablespoons of flour mixed with the remaining half-cup of water, and stir in a portion of the chopped fresh parsley (reserving a little to sprinkle over top). Of course, traditionalists, or those like myself looking to introduce a little more tangy richness into the mix, may also consider stirring in up to a cup of sour cream just before serving—an addition that both brightens, and thickens, the accompanying sauce (just don’t do this if you plan on reheating as the cream will curdle). Either way, ladle the stew across a plate of wide egg noodles, sprinkle with the remaining parsley, and you have the sort of cold weather meal destined to generate family traditions all your own. TRG note: Prior to browning the meat I like to sprinkle it with 3 tsp of salt and 2 tsp of black pepper, tossing to coat evenly—an additional step that ensures the beef will have plenty of seared-in flavor. —In a large pot (TRG note: I used a 6¾ quart Dutch oven) over medium heat, heat 2 tbs oil. Once the oil is shimmering add a third of the meat and brown on all sides (about 5 minutes total). Remove meat and set aside on a plate. Repeat process twice more, adding additional oil by tablespoon increments as needed. —Once the meat has browned, add another 2 tbs of oil to the pot (less if it still looks moist), along with the onion, the garlic, and a little of the paprika, and sauté until softened, 4 to 5 minutes. —Return the beef to the pot and sprinkle with the remaining paprika. Add 3½ cups of the water (or wine if substituting), the beef stock, and the bay leaf. Simmer, covered, for 2 hours. 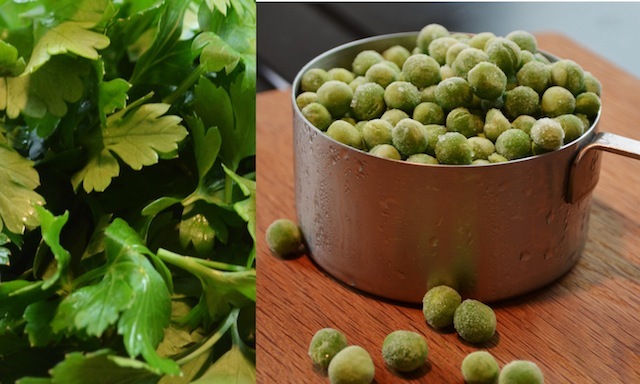 —Add the carrots and the peas, and cook until tender (about 40 minutes more). Season with salt, pepper, and the chopped parsley to taste (TRG note: I used 1 tbs salt, 1 tsp pepper, and 4 tbs of the chopped parsley), reserving some of the parsley to sprinkle over the top of the goulash just before serving. —Mix the flour with the remaining ¼ cup water until smooth and paste-like, and stir the mixture into the stew to thicken it. (TRG note: I also allowed the stew to simmer another 30 minutes or so at this point, uncovered, to reduce the broth and intensify the flavors). To make a more rustic stew, add torn pieces of crusty bread. —Adjust seasoning as needed, sprinkle with the reserved chopped parsley, and serve over egg noodles (TRG note: to thicken the sauce further, and to add a slight tang to the flavor, stir in a cup of sour cream immediately before serving—just don’t let the stew simmer or boil after the addition as the sour cream will curdle). Brad, is this really 6lbs of meat to one pound of carrots? In the picture it looks like they are almost equal quantities. Does the meat cook down a lot? Looking forward to making this! Before the Austro-Hungarian Empire takes revenge and invades New York, and your apartment specifically, I should direct you to Wikipedia and the pretty good article on Pörkölt, the dish you are making. I can still hear by friend Gotthard Böhm shrieking, 'Nien, Nien, Nien Schatzi, das geht nicht' each time he saw the word Goulash falsely featuring on some menu. Fattier meat, like flank steak, would be good too. It may not help the waistline but then Hungarians only come in size chunky or extra chunky.